Originally confined to a small circle of believers centered in Jerusalem, Christianity's stunning transformation into the world's most popular faith is one of history's greatest, most miraculous stories. 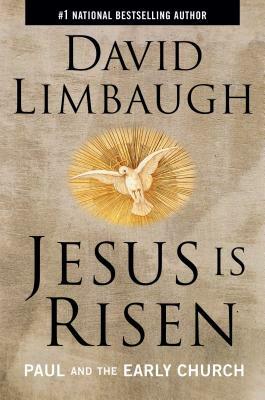 In Jesus Is Risen, #1 bestselling author David Limbaugh provides a riveting account of the birth of Christianity. Using the Book of Acts and six New Testament epistles as his guide, Limbaugh takes readers on an exhilarating journey through the sorrow and suffering, as well as the joys and triumphs, of the apostles and other key figures as Christianity bursts through the borders of Judea following the death, resurrection, and ascension of Jesus Christ. Limbaugh particularly focuses on the crucial role that the Apostle Paul played in these historic events. Facing incredible adversities, from arrests to shipwrecks to violent mobs and murder plots, Paul overcomes countless obstacles as he travels far and wise to spread the Gospel. Limbaugh's passion for the Bible is unmistakable and infectious as he recounts these stories. Replete with deep insights into the actions, arguments, and challenges of the world's first Christian communities, Jesus Is Risen is a faith-affirming book for Christians at all stages of their faith walk. David Limbaugh is a lawyer, nationally syndictated columnist with Creators Syndicate, political commentator, and author of nine national bestsellers, including Crimes Against Liberty, The Great Destroyer, Jesus on Trial, and Jesus is Risen. The brother of radio talk show host Rush Limbaugh, he lives in Cape Giradeau, Missouri. Follow him on Twitter: @DavidLimbaugh. "My brother has done it again! He has taught me more about Christianity than I thought I could learn, and this book will do the same for you. You will find no better, more convincing interpretation of these books of the Bible than right here in Jesus Is Risen. This is an exciting and understandable analysis you will savor and appreciate. Don't doubt me." "I know David Limbaugh to be a man of deep faith, and never has that faith been better put to use than in this insightful examination of the early Christian Church. No other history is more demanding of our attention, and for this lay reader no one has done a better job explaining it. And on a personal note, David has been instrumental in inspiring my own faith journey, for which I am forever grateful." "Freedom isn't possible without freedom in Christ, and to understand this, you need to understand the Bible. David Limbaugh has done readers a wonderful service in this Bible-baed history of the early Christian Church. It is a must-read book for anyone who wants to understand the roots of Christianity and the importance of grace." "One of the greatest defenses of faith is history, and in Jesus Is Risen, David Limbaugh reveals the true history of the early church in a way that everyone can understand and be inspired by. Great book!" "Jesus Is Risen takes you on a wonderful tour of Paul's inspiring writings and Luke's historical masterpiece to unpack the most important event in human history—the Resurrection of Jesus of Nazareth. As David Limbaugh has shown in his three recent works on Christianity, he is a master at perching you high enough to give you the grand view, while also knowing when to dive deep enough to pull out helpful spiritual insights. This is a nourishing read for both the seeker and long-time Christian. Highly recommended!"